Storage cases are essential when you are looming. 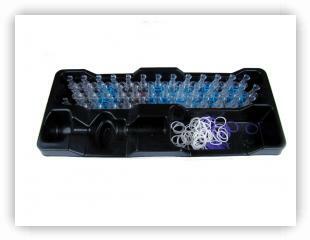 They are helpful to store all the tools and elastics in a organized container. You may also need a storage case for your finished products. 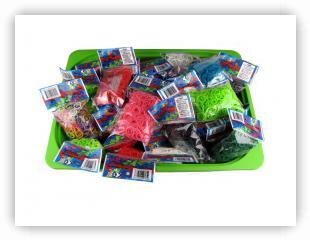 And when you are stocking up on elastic bands, you guessed it, you need a place to store these too. One realization you will make fairly soon, is that one container is often not big enough to house all the elastics you will be collecting. 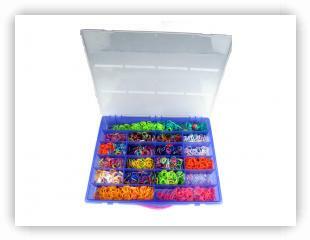 If you are collecting elastics, then either you will need a large storage case, or many smaller ones...there are over 45+ different colors and types of elastics available for looming, so if you want to collect all these elastics, you will need storage cases. You may need a case as well for travelling purposes. Something you can use on a longer car trip, or something you bring to a friend's house for a looming play-date. When you first purchase your loom, the box it comes in makes a very good "free" initial storage container. In this picture, we are using the plastic separator to hold the loom and a few elastics. Once you start purchasing more elastics, or make a few bracelets, you will realize fairly soon that you will need a place to organize and store the elastics and pieces of jewelry. Another nice "free" storage case which is probably sitting around the house is a shoe box. This is nice for holding what you need, but it lacks separate compartments. 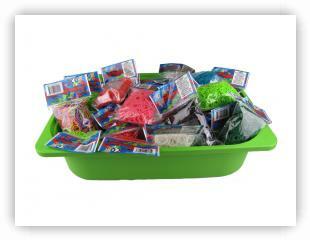 Storage tubs are available at many locations. If you have a plastic storage tub sitting around, this also makes a nice storage case, especially for stock piling elastic bands. This one was purchased from IKEA. Here is another angle of this storage container. Excellent for storing those extra bags of elastic bands. 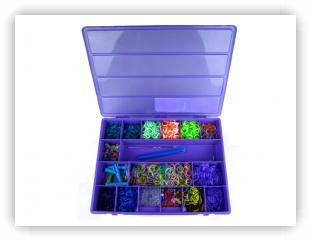 There are storage cases made specifically by manufacturers, such as Rainbow Loom. However there are plenty of other cases on the market as well. 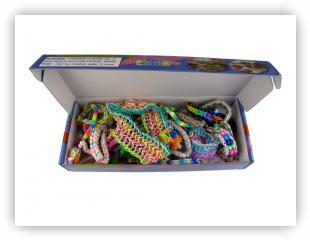 Some cases are specifically made for the Rainbow Loom, and elastics, with a larger compartment for the loom, and divided compartments for the elastics and clips. 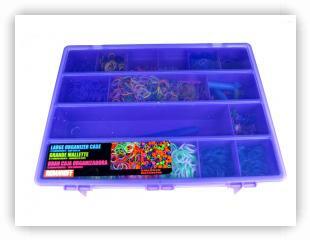 Here is another storage container made specifically for the Rainbow Loom, or similar looms. These cases are made from 2 molded pieces of plastic, one for the container, and the other for the lid. 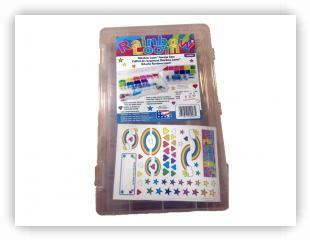 However cases do not have to be specifically made for the Rainbow Loom. Many hardware stores have containers with adjustable compartments. These are ideal because you can create a larger compartment for the loom and loom tools, and smaller compartments for your elastics, clips and finished jewerly. Storage cases from hardware stores are very suited for storing the tools of the trade. 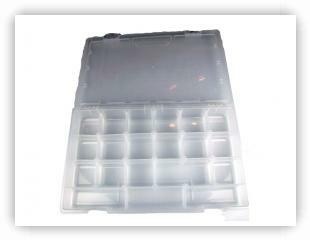 Most have compartments which can be adjusted by removing / arranging internal plastic dividers. 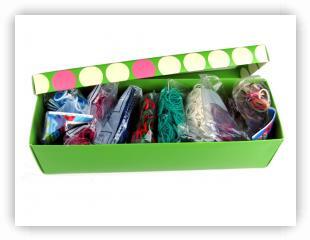 You can create a large compartment for the loom and loom tool, and small compartments for the elastics and clips. Many of the existing bracelet patterns can be combined with beads. 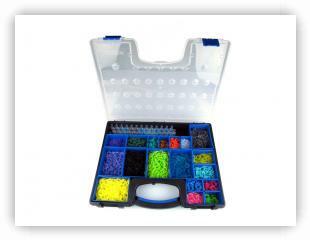 Many loomers now combine these beads with their patterns, so you may now have a storage case which came with the beads. These are also suitable for storing elastic bands. 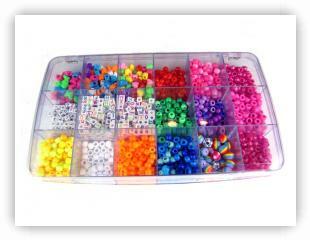 Perler Bead or Pony Bead storage cases can be used to store elastic bands as well. 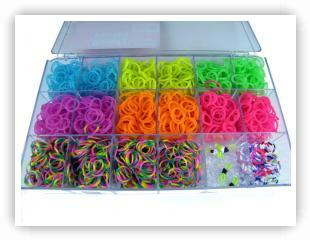 Another picture of a case made specifically for looms and elastics.